We have just launched our brand new You Tube channel, so you can see the guys and gals at Iron Works pushing their bodies to the limit. 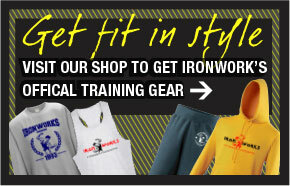 Keep an eye out on the Iron Works blog for the latest news, videos and events.. Copyright © 1993 - 2019 Ironworks Gym | All Rights Reserved.